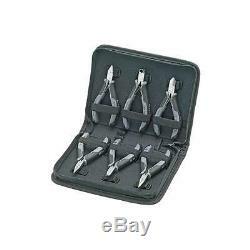 002017 Electronics Pliers Set Case made of hard-wearing polyester fabric, pliers are held by elastic band, zippered. 6 parts, contains 6 ESD electronics pliers, electrically discharging version ATTRIBUTES: Barcode: 4003773031222 Net Weight: 695g Style: Electronics Pliers Set ITEM CONTENTS: 1 Electronics Pliers ESD 3512115ESD 115mm 1 Electronics Pliers ESD 3522115ESD 115mm 1 Electronics Pliers ESD 3542115ESD 115mm 1 Electronics End Cutting Nippers ESD 6432120ESD 120mm 1 Electronics Diagonal Cutters ESD 7702115ESD 115mm 1 Electronics Diagonal Cutters ESD 7732115ESD 115mm. Electronics Pliers Set Knipex 002017 6 Piece Net Weight: 695g. Case made of hard-wearing polyester fabric, pliers are held by elastic band, zippered. 6 parts, contains 6 ESD electronics pliers, electrically discharging version. On rare occassions this may not be possible due to circumstances outside our control. If this is the case we will contact you to explain the reason for the delay. Wahankh Pty Ltd trading as Blue Bar Industries and Aussie Online Bargain Warehouse is an Australian and Operated business and abids by Australian retail laws. Wahankh Pty Ltd trading as Blue Bar Industries acn: 167 220 902 We are an Australian owned and operated company located in Caboolture QLD. Auctiva offers Free Image Hosting and Editing. The item "Electronics Pliers & Case Set 6pc Electrical Data Knipex Trade Quality Tools" is in sale since Monday, May 14, 2018. This item is in the category "Home & Garden\Tools & Workshop Equipment\Hand Tools\Pliers". The seller is "blue_bar_industries" and is located in Caboolture.